Snails have a very sticky substance known as snail slime that we must clean before using the snails in our cooking. You will need a blunt object for breaking the shells of the snails. You will need a pointed object to push the snail out of the shell. Salt has an abrasive property that is why it is used to remove snail slime. Simply pour lots of salt into a bowl of shelled snails. Rub the salt on the snails till the slime is gone. The acid in lime juice attacks snail slime and cleans up the snail quickly. Though lime and lemon have acidic properties but I find that lemon is more efficient than lime. Maybe lemon's acid is more active than that of lime. You can see the slime curdle almost as soon as you sprinkle lemon juice on the snails. Lemon is the most efficient of all the items that remove snail slime especially when you are cleaning a bowl of snails. Alum is the most effective of all the items that can remove snail slime. It gives the snails a squeaky clean. It takes a lot of hard work though and it is not as efficient at cutting the slime as lemons especially at the beginning when the slime is still very thick and concentrated. That is why I use a combination of lemon and alum (efficiency and effectiveness) for a squeaky clean result. Alum is a safe additive to foods but you should do your own research before you use it. 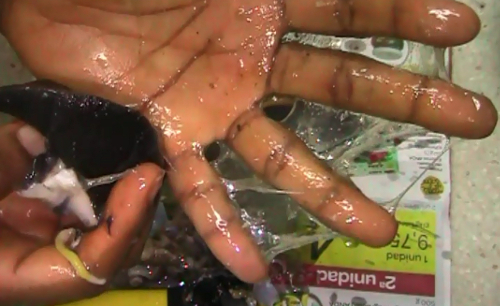 There are a few other methods of removing snail slime. For instance, I have heard about boiling the snails for a bit or pouring hot water on them but I do not use that method because boiling the snails and pouring away the water would be depleting the nutrients that the snails contain. Cut the lemons into two equal parts and set aside. For 10 big snails, you will need about 3 juicy lemons. Bring out the alum ready for use. A piece of alum is enough for 10 snails. 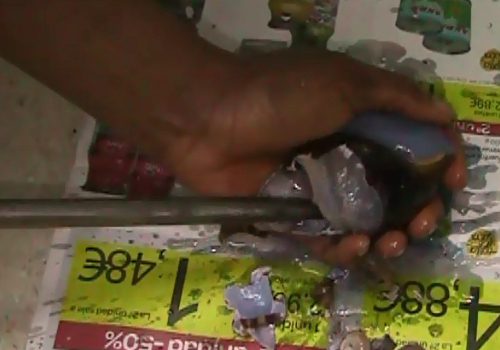 Using the blunt object, hit hard on the snail shells to break up the pointed end of the shell. Then use the pointed tool/utensil to push the snail till it comes off the other end. Note: If you break the whole shell into pieces, the resulting tiny shells may be stuck on the snail and these are difficult to remove because of the slime. So make as little mess as possible when breaking the shell. Remove the tiny pieces of shells at the point where the snail attaches itself to the shell. Be careful when doing this because those tiny shells can be very sharp. Remove the snail's intestines and feel the snail with your fingers to make sure there are no tiny shells left behind. Repeat the process for the rest of the snails and place them in a bowl. 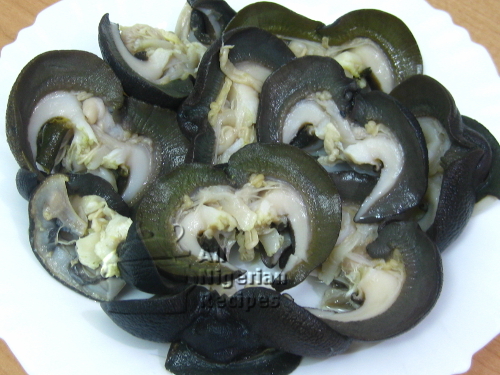 Sprinkle the lemon juice on the snails in the bowl and mix very well, making sure the juice touches every snail. 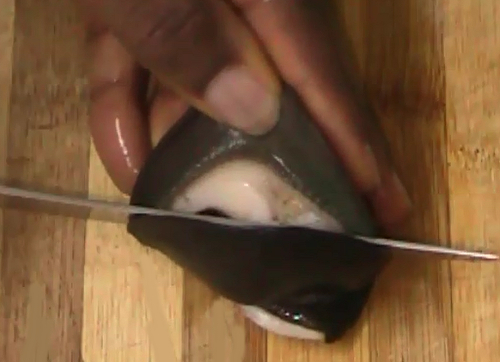 While the juice is attacking the slime, use the blunt side of a knife to scrape off the brown stains on the white parts of the snail. Watch the video below to see what I am referring to. Then use the half moon cuts of lemons to scrub the snails all over till all the slime is gone. Even before you do this, you will notice that the snail slime is no longer that slimy. When done, rinse and continue with alum. Concentrate on rubbing the alum in the parts where the lemons did not reach. Spread the tongue of the snail and rub the alum in there. When it feels squeaky clean, rinse very well in plenty of water. Cut the tongue of the snail and clean the exposed area with alum. Rinse again in plenty of cool water to remove all traces of alum from the snails. Once you rinse very well, the alum will not change the taste of the snail. That's it! 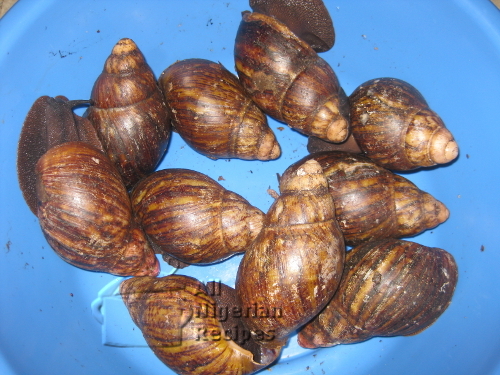 You can now use the snails for Peppered Snail and in Nigerian soups recipes. Snails go well with Bitterleaf Soup, Ora (Oha) Soup and Ofe Owerri.